Conscious consumerism can be fun. The 6th Annual Milwaukee Fair Trade Crawl on Saturday, May 11, will allow you to make some socially conscious purchases, have fun and even win prizes, all in a festive atmosphere. This year, the crawl coincides with World Fair Trade Day. And, with the recent building collapse in Bangladesh that’s taken the lives of more than 400 workers, the Fair Trade Crawl, which bills itself as “the alternative to sweat shops,” addresses a topic prevalent in news headlines worldwide. 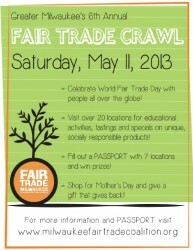 You’ll have more than 24 retail outlets, including 20 Milwaukee businesses, to choose from at the Fair Trade Crawl. (As the name suggests, you travel through the city from one retailer to the next.) Food and beverage tastings will enhance your shopping and learning experience. Because Mother’s Day is May 12, this is sort of a “perfect storm” of doing something positive for workers locally and worldwide, while meeting your immediate shopping needs. Crawl participants will join people around the world to celebrate Fair Trade Day, invest in their local economy and learn about how Fair Trade is helping make the world a better place for artisans and farmers in developing countries, according to Mike Howden, of the Milwaukee Fair Trade Coalition, the sponsor of the crawl. 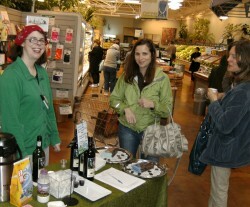 Fair Trade Crawl 2012 participants enjoy wine and chocolate samples at Outpost Natural Foods. Photo by Steve Watrous. Defining fair trade can be a complicated thing, says Steve Watrous, chair of the Milwaukee Fair Trade Coalition. “It’s just one aspect of the socially responsible consumer movement,” he says. “If a company is making T-shirts somewhere, the people have to be treated decently, make a living wage, have the right to organize, and have decent health and safety on the job. “ And you, the consumers, can make that happen. “It’s the concept that consumers have a lot of power, especially in the U.S., where we consume more than any country in the world,” Watrous says. “Every other country wants to send products to us to consume.” Why not use that power in a positive way, he asks. The shops and businesses that participate in the Fair Trade Crawl must have at least one fair trade product certified by a third party, Watrous says. Prior crawls were limited to local ownership, but this year Whole Foods is included. Participating shops pay a basic fee of $35. All the stops on the crawl have some degree of commitment to the fair trade movement, Watrous says. Watrous calls this the first festival of the season. The crawl got its start in 2007, after Milwaukee’s Common Council passed a fair trade resolution in July of that year. “Fair Trade Towns” is a designation given to more than 300 cities and towns in the United Kingdom and Europe. While there are two small towns in the U.S. that have joined that group, Milwaukee is the only major city to do so. Howden and Watrous, who established the Milwaukee Clean Clothes Campaign with a goal to keep products produced in sweatshops out of Milwaukee stores even before the Common Council’s resolution, decided to act on the Fair Trade City designation. A kick-off event was held in October 2007 and plans were laid then for the first Fair Trade Crawl to mark World Fair Trade Day in May of 2008. 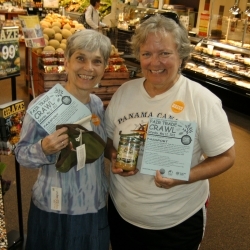 Two lucky prize winners at last year’s Fair Trade Crawl. Photo by Steve Watrous. Shops participating in the 2013 Fair Trade Crawl are listed at www.milwaukeefairtradecoalition.org. You’ll also find a downloadable passport on the website. Shoppers who identify the featured product offered by at least seven of the crawl businesses will be entered in a prize drawing. You could win a pair of Wigwam socks, produced right here in Sheboygan, Wisconsin. “Wigwam is anti-sweatshop,” Watrous says. “They’ve resisted all urging to move their operations off-shore and they’re very union friendly.” Other prizes include Fair Trade coffee, soap and more. Completed passports must be turned in between 3 and 5 p.m. at one of three locations: Outpost Natural Foods on Capitol Drive, Sven’s European Café on Kinnickinnic Avenue in Bay View, and Outpost Natural Foods on State Street in Wauwatosa. There are no set hours for the crawl itself, so check out the Saturday shopping hours for the locations of your choice. 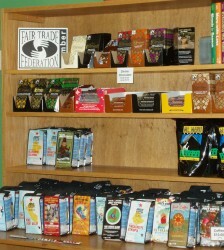 Fair trade chocolate, such as these items available at Four Corners of the World, is a popular item all year long. Photo by Peggy Schulz. Crawl organizers suggest making a day of it, if you can. Options for shoppers include starting with fair trade banana waffles at Sven’s or breakfast at Amaranth Bakery or the Riverwest Coop. Then, partake in samplings and shopping at stores you’ve always wanted to visit. Have lunch at one of the many coffee shops featuring Fair Trade coffee. Free samples available at a variety of locations on the crawl include Equal Exchange coffee and chocolate bars at the two Outpost stores. Four Corners of the World on 54th and Vliet will have Mt. Meru coffee, Divine chocolate and free books on Fair Trade for kids (while they last). Fair Trade for All will feature music, coffee samples and educational activities all day long.